Every gift powers prisoner political education, the Care Not Cops campaign, and our new DCBC Abolitionist community center! We are fundraising for abolition. Dear supporters of Critical Resistance Portland! As we approach the end of the year, we invite you to make a meaningful gift to CR PDX and celebrate a year of excellent effort, inspiring gains, and fierce dedication. Every contribution will strengthen our capacity to dismantle the prison industrial complex (PIC)! This year, CRPDX celebrated our 5th birthday and we are humbled and thrilled to be on the road to abolition with you. Every month in 2018 we hosted our prisoner correspondence mail night program, which provides political education materials and discussion to hundreds of imprisoned people in Oregon and Washington. This was our 5th year! Thank you for every gift of stamps, funds and support along the way. We hope you will give a thoughtful gift to keep us going strong. We made great gains in the Care Not Cops campaign, which aims to decouple police as first responders to perceived mental health crises. Our community forum and powerful mobilizations succeeded in cutting the proposed police expansions *in half*, saving Portland $6 million and keeping over 35 new police positions out of the city plan! We made a huge leap forward with our Portland community this year and opened the Dismantle, Change, Build Center (DCBC) a community space to host meetings, events, and office space to support abolitionist and community work in Portland. 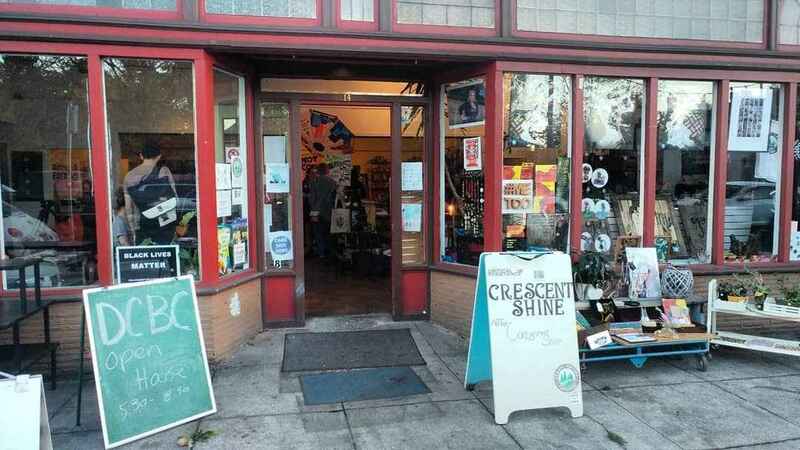 This building is a resource for our movements in Portland, and we invite you to help keep this space in our hands! Your gifts will keep the doors open, the lights on, and the space ready for our people. Your contributions will celebrate the past 5 years of CR PDX (and 20 years of CR as a national organization!) and provide us with the resources and support to make our future irresistable. We invite you to join us and offer your support. There's no day like today to align your principles, hopes and fiercest dreams. Thank you! $20 prints a batch of color flyers to spread the word about Care Not Cops. $50 sends a copy of Are Prisons Obsolete? to 8 folks who are imprisoned in Oregon and Washington. $200 keeps the heat on at DCBC for a month. $500 sponsors two community events at DCBC, making it accessible to working class people and community groups. $1,000 supports a weekend long member training and skillbuild with organizers. $2,000 sponsors one month of community access to DCBC. Please share this page with friends and community. We are majority grassroots funded and every penny helps chip away at the PIC. Thank you so much for powering our movement. I can't make it to the holiday party but totally support what you're doing!! thank you so much!! Can't make it to the holiday party, so here's $20 for stamps (or whatever). Thanks for all you do.